Cotton always looked up to meet and greet the people when they came to see her. She was a wonderful therapy bunny. Cotton still participated in therapy sessions even when she had late-stage breast cancer. She enjoyed the attention and love she got and always returned it. Cotton, was a New Zealand White rabbit, that was adopted by Kathryn from For Bunny Sake Rescue, South Jersey, A huge thanks to Wendy. Cotton was a great gal, who really enjoyed her unlimited supply of hay, rabbit pellets, and a wide variety of vegetables. Cotton especially enjoyed kale and carrots. 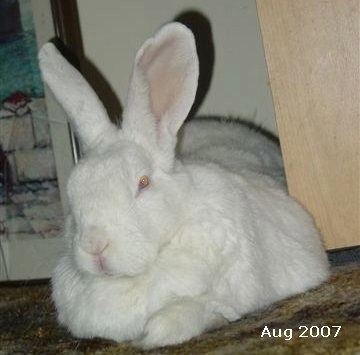 Cotton was on found on the streets of N.J., brought to a local shelter, and then delivered to the rabbit rescue at the end of May 2004. Kathryn adopted Cotton, 08-21-04, the actually day, Ben and I had to pick up Brutus’s ashes at University of Penn. Cotton’s coming, helped ease Brutus’s leaving. Her former names wee Pina Colada, Whiskey Sour, and Bun-Buns. Cotton had the most beautiful shiny white coat and large red eyes. Cotton was very relaxed and laid back, and just touching her fur on her back, you really could feel the “cotton.” Cotton’s stunning eyes always got people’s attention! Cotton, lived at The Gress Mountain Ranch, a “forever” home for large & small animals at our animal sanctuary. Cotton, was a loving member of the Gress family, and got along well with 2 Great Prys, Rocky & Kayla, an array of cats, and she tried hard to befriend, the other bunny Cocoa Puff. Cocoa Puff needed to learn the sweet disposition that made up Cotton. Cotton, had another big job. 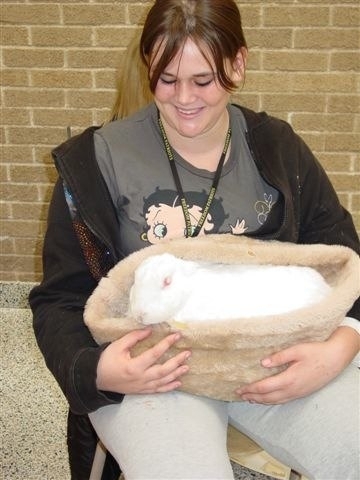 Cotton, was a therapy rabbit and for most of her short life, about 4 years, she worked with troubled youths, some really angry kids, kids who could not pay attention in school, some anxious, and depressed adults, and truly a challenging population of people. I often thought, “Cotton, what do you make of all these people with some many problems?” Cotton was resilient. Off the streets herself, she survived and had a great life at the ranch, and then an active partner in Animal-Assisted Therapy, as a co-therapist, with me. Many people like and loved Cotton, especially two ladies, Miss Loretta, who has been dedicated to helping the animals and a strong promoter for Animal-Assisted Therapy, and Miss Jessica, who nurtured and cared for Cotton, holding and petting her, and even giving Cotton her much needed daily bathing to keep up Cotton’s hygienic care and health. Cotton, almost a year ago, was diagnosed (I have to catch my breath, and wipe the tears from my eyes and face, before I proceed ) with Cystic mastitis and Adenocarcinoma or Breast Cancer, which later spread to the uterus, and then to the lungs. We spay our animals, but still the dreaded big C came. 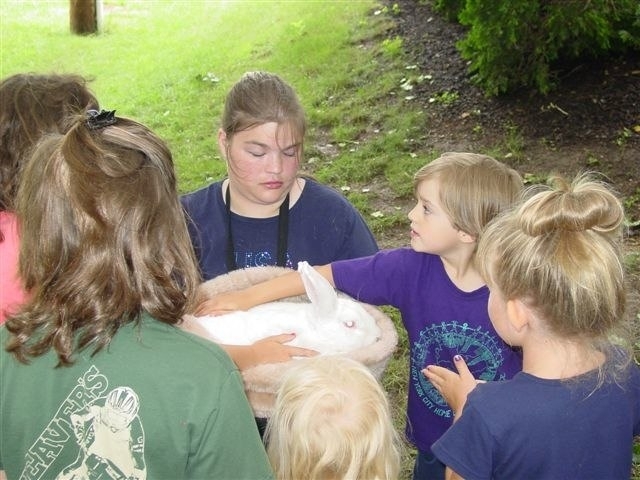 Cotton, continued to eat well and even got around hopping, and did her last therapy session with some children, just a week before her death. On Cotton’s last night, she wanted to stay in the greenhouse-full of plants, and she went to the patio door, looking out towards the sun. I told Cotton, that she didn’t have to hang on for me. I tried to give her permission to pass over to rabbit heaven. Ben brought her last request: kale, carrots, and celery. The next morning, I had place her in her cage and I could see Cotton was transitioning to her “rainbow bridge” experience. I stayed with Cotton the whole time, and told her I loved her and how proud I was of her work to help heal people. Cotton had made a huge difference, especially with women’s issues, ie…breast cancer….